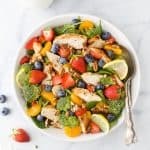 Detox Strawberry Chicken Salad with juicy strawberries, mandarin oranges, blueberries and grilled chicken then drizzled with a Honey Mustard Dressing. Heat a grill to medium high heat, about 350-375 degrees F.
Spray grill grates with cooking spray or rub down with olive oil soaked cloth. Remove from grill and let rest on a cutting board for 5 minutes to let the juices redistribute. In the meantime, to a small bowl add: whole grain mustard, dijon mustard, honey, lemon juice, garlic clove, dry basil, salt and pepper. Whisk until smooth and looks like a dressing. Set aside. Assemble the salad: to a large bowl add baby spinach, strawberries, blueberries, broccoli, mandarin oranges, pecans and green onions. Top with sliced grilled chicken and drizzle with honey mustard dressing to serve.